GLASGOW – Inter began the knockout stages of the 2014/15 Europa League in pulsating fashion, with a 3-3 draw at Celtic Park in Glasgow. Guidetti's strike in second-half stoppage time levelled the game after five goals were scored in the first half. The game started with the rain pounding down and the tune of You'll Never Walk Alone reverberating around the stadium known as 'Paradise', as 60,000 Celtic fans tried to inspire their team. For anyone who loves football, it was quite a sight to behold. 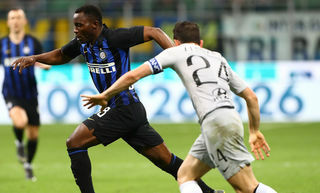 The crowd was silenced in the fourth minute when an inspired Kuzmanovic released Shaqiri, whose shot from a tight angle hit the goalkeeper before he placed the rebound in the far corner. Celtic rallied like a boxer in the first round and tried to up their rhythm. But with eight minutes on the clock a corner from Kuzmanovic turned into a Shaqiri assist with Palacio netting to make it 2-0. The 3,000 Nerazzurri fans who had made it to Scotland all the way from Milan exploded with joy. Mancini immediately got up from the bench to demand calm and concentration. His reasons soon became clear when Inter conceded two goals in an incredible two minutes as Celtic drew the game level: a strike from Armstrong and an unfortunate own goal by Campagnaro. It was hugely against the run of play up to that point. The Celtic Park crowd – the real stars of the evening – started to make themselves heard again and ratcheted up the atmosphere. 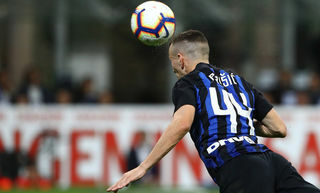 A free kick from the edge of the box caused a bit of concern for the Nerazzurri rearguard before Shaqiri and Palacio fashioned another counter-attack, but the Argentine dallied and the opportunity slipped by. 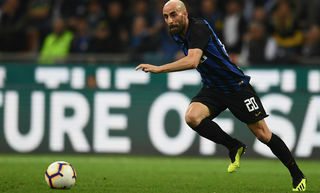 As the first 45 minutes came to a close, an awful mistake from Gordon on a long through ball from Shaqiri gave Palacio the chance to make it 3-2. The Argentine made sure this time and silence reigned as the teams headed into the changing rooms. Inter made no changes to the XI that started the first half: Carrizo in goal; a four-man defence of Campagnaro, Ranocchia, Juan Jesus and Santon; Medel, Kuzmanovic and Guarin in midfield; Shaquiri in the hole; and Icardi and Palacio up front. The rain had stopped at Celtic Park and the Nerazzurri started the second half with the swagger of a great team. Eight minutes after the restart, Shaqiri ran the length of the pitch on the wing before cutting inside and testing the Scottish goalkeeper. In the 60th minute Guarin had Gordon worried from a free kick, before a powerful shot by Griffiths drew a great save from Juan Pablo Carrizo. The Argentine goalkeeper outdid himself again to deny Armstrong two minutes later, displaying positional sense and smart reflexes. Celtic were finding their way back into the game and the crowd were getting louder again. Icardi was replaced by Kovacic and Shaqiri joined Palacio up front. On 75 minutes Guarin found Shaqiri, whose strike was goalbound but this time Gordon did well to move his feet and save it. The game then moved into stoppage time, when Celtic got an unexpected equaliser through Guidetti following good work from Brown. A 3-3 draw flattered the hosts based on the match as a whole but that's what can happen if you don't manage to close out the game. 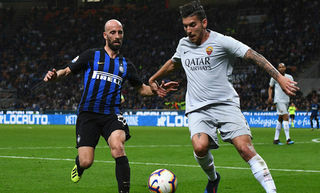 The return fixture at the Meazza in seven days' time will be another battle and Inter will need to be at their best to get through to the next round. Scorers: Shaqiri 4, Palacio 13, 45, Armstrong 24, Campagnaro og 26, Guidetti 90+3. Celtic: 26 Gordon; 2 Matthews (Ambrose 76), 22 Denayer, 5 Van Dijk, 3 Izaguirre; 8 Brown, 6 Biton; 16 Mackay-Steven, 25 Johansen, 14 Armstrong (Henderson 75); 28 Griffiths (Guidetti 75). Subs not used: 24 Zaluska, 12 Scepovic, 32 Wakaso, 42 McGregor. Inter: 30 Carrizo; 14 Campagnaro, 23 Ranocchia, 5 Juan Jesus, 21 Santon; 18 Medel, 13 Guarin, 17 Kuzmanovic (Dodò 79); 91 Shaqiri; 8 Palacio, 9 Icardi (Kovacic 75). Subs not used: 1 Handanovic, 15 Vidic, 20 Obi, 28 Puscas, 88 Hernanes. Booked: Shaqiri 38, Santon 67, van Dijk 70, Campagnaro 80, Johansen 87, Henderson 90. Added time: 1 + 5 minutes. Mancini: "Great start, wrong to ease up"